Environmental, Health and Safety News: Peak Canadian Wood? A new report on the mountain pine beetle epidemic describes it as one of North America's largest natural environmental disasters that will put an estimated 16 major sawmills out of business in B.C. and lead to long-term lumber shortages in the United States. Canadian lumber production is not expected to recover for the remainder of the century, one of the report authors said Thursday. "We sort of think lumber production has peaked forever, at least relative to our lifetimes and our children's lifetimes." said Russell Taylor, president of the International Wood Markets Group. The Vancouver-based consulting company is one of three consultants who prepared the report for lumber industry clients. Interior sawmills are expected to start running out of good timber within three to five years according to the report. Coupled with reductions in the Ontario and Quebec timber supplies, the pine beetle epidemic is expected to reduce Canada's share of the U.S. lumber market by 50 per cent. Lumber prices are expected to soar. 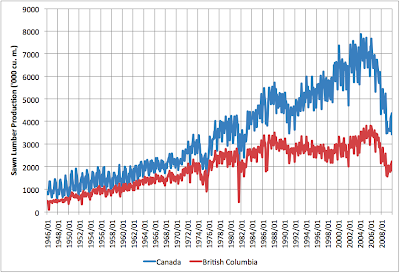 ... lumber production both for Canada as a whole, and British Columbia in particular. The data run from Jan 1946 through December 2009. As you can see, BC is responsible for about half of Canadian lumber production. The claim of the report is that those 2005/2006 peaks will not be reached again in the 21st century, on account of bark beetle damage. For maps of the epidemic, see here.